Designing a new kitchen? 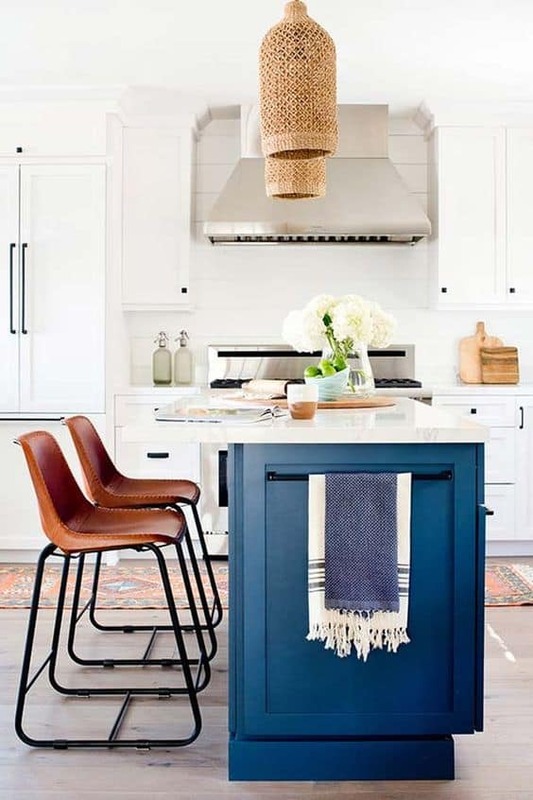 Get the best kitchen planning tips here! We are officially one month in on our renovation. And we also just wrapped up the details on our overall kitchen cabinet design and layout. Exciting stuff! But considering the kitchen is the heart of the home, I felt tremendous pressure to get this part right. I mean, you are spending a lot of money and can’t exactly swap it out when you’re done. Today, I wanted to walk you through the process we took from start to finish. 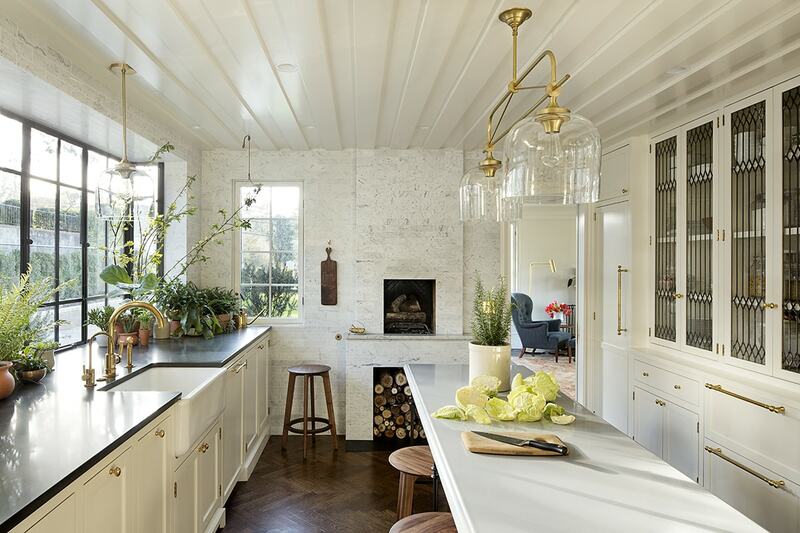 If any of you out there are planning a kitchen remodel now or down the road – this one’s for you! Sometimes it’s hard to know where to even start with a kitchen design. 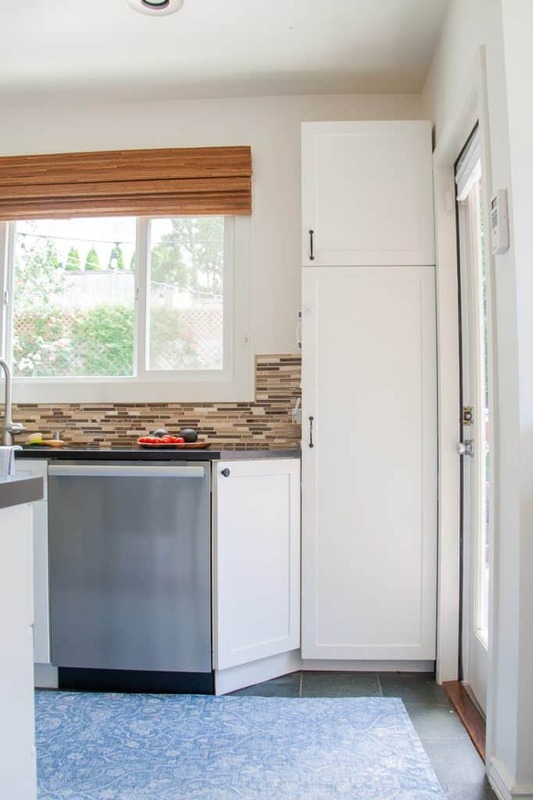 And if you’re not planning a kitchen remodel – I hope you enjoy seeing the before & afters and pick up some inspiration here. Before you start doing anything, it’s important to establish your budget. With any project, having your budget in place will help steer you in the right direction with choosing cabinets, counters, hardware and appliances etc. First, a little trip down memory lane. The layout wasn’t great for us. We didn’t have enough counter space for cooking and preparing meals. We also didn’t have enough cabinet storage (I had to keep some smaller kitchen appliances stored in our laundry room). I mean, not the end of the world, but I hated having to go all the way downstairs just to grab the food processor. Something else that really bothered me? Our kitchen sink wasn’t centered with the window. The Type A part of my brain just wasn’t having that. I also didn’t like having my garbage and recycling cans out in the open – they were mismatched and stuck out like a sore thumb. So, the first step I took in this whole process was making a list of everything I already had. Prior to the start of the renovation, I decluttered the whole kitchen. I threw out/donated a bunch of stuff we never used. It felt so good to clear up kitchen space in my mind and I’m super happy with everything that’s left. If you get a chance to declutter, it makes the process a lot easier! I took stock of whatever was left over. It’s good to have an idea of what you have so you can figure out storage and function needs. Dishware, Bakeware, Cookware, Mixing Bowls, utensils, knives, serving dishes, everyday dishes and glasses, wine and beer glasses, pitchers, trays, pizza stones etc. Smaller appliances : Microwave, coffeemaker, toaster, food processor, Instant Pot, Blender, etc. FOOD! Don’t forget about food. Tally up what pantry items you usually buy so you can estimate a good pantry size to meet the needs of you and your family. For us, that was cereal, canned goods, pasta, chips/kids snacks, potatoes, onions etc. Oh and spices and oils! Garbage bags, dish soap and dishwasher detergent, cleaning supplies, sponges, extra paper towels (if you buy in bulk), dish towels and rags. Basically all the stuff we usually keep under the sink. Ziploc bags, aluminum foil, saran wrap and those items. Junk drawer – Do you have a drawer in your kitchen donated to pens, noted pads, chargers, menus etc? Make sure to include those items on your list too. Pet bowls and food and leashes (if you generally keep a drawer/cabinet in the kitchen for that). 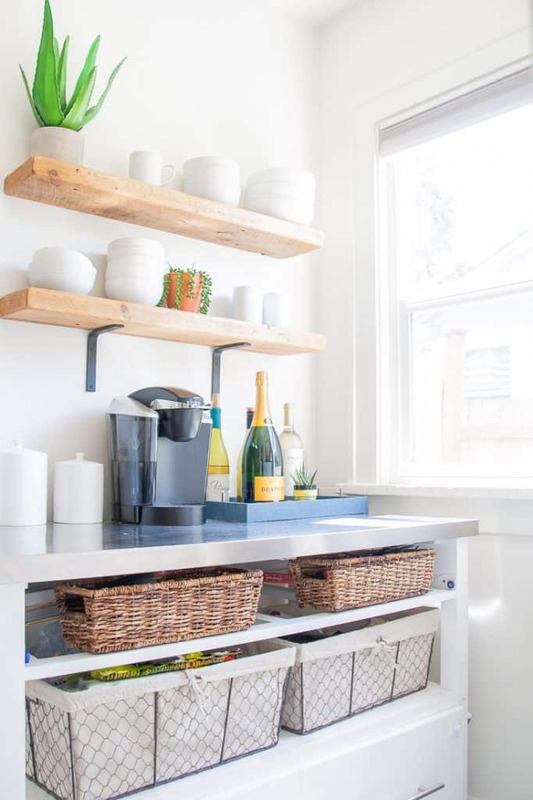 I sat down with my husband and we figured out what was really important to us as far as function and storage in this kitchen. Sink centered with the new kitchen window! You should be thinking about appliances too – the more specifics you know, the better. (like the exact model numbers.) You will need the measurements to design the kitchen in the next step. Yay! The fun stuff begins. 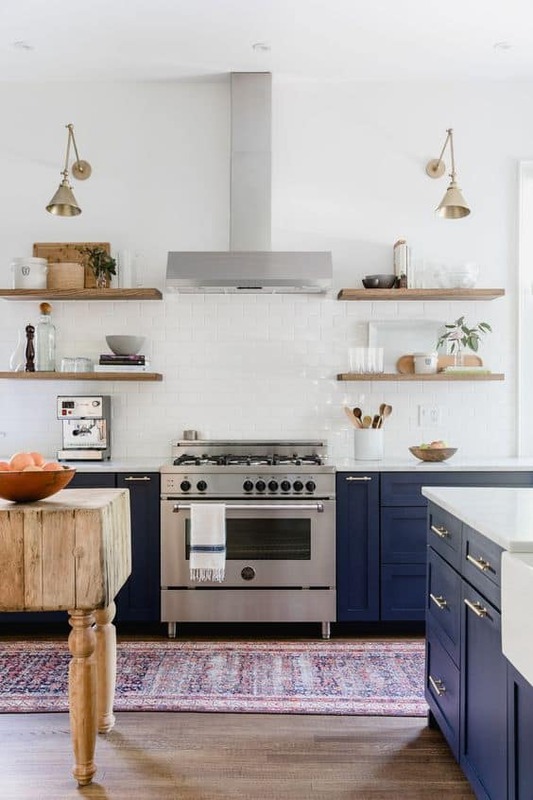 Time to get lost on Pinterest, Instagram and anything else to get ideas for the style of kitchen you want. 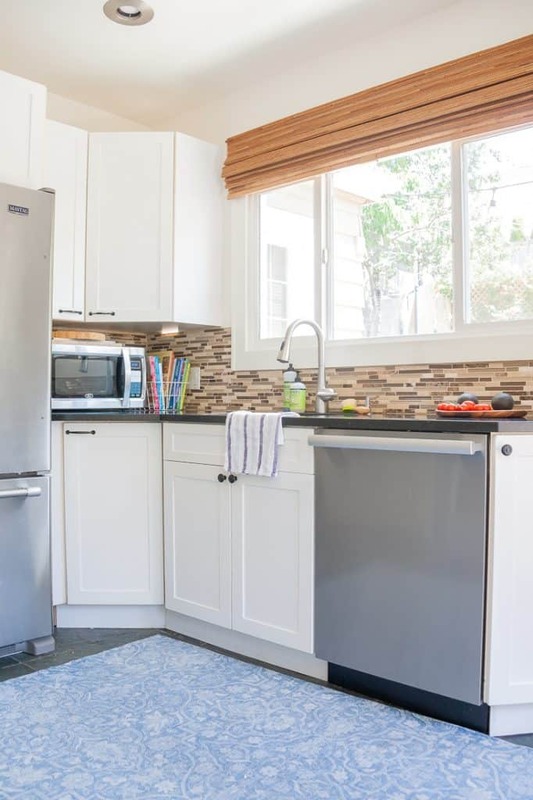 We already knew what we wanted as a base – white shaker cabinets. They are timeless. 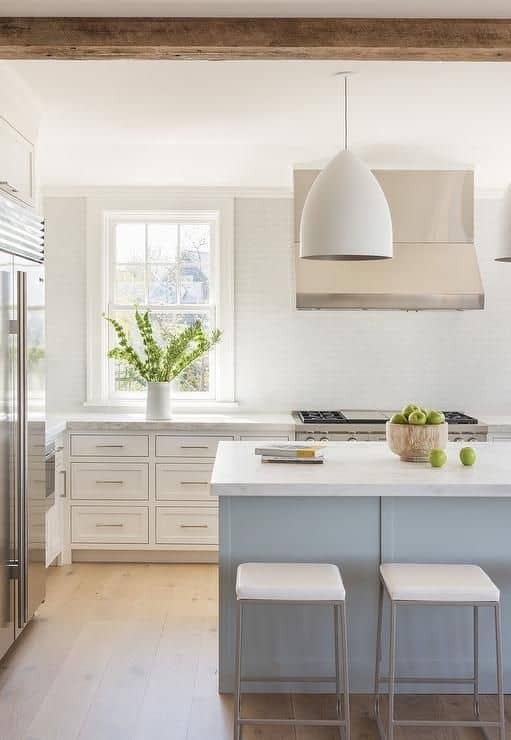 I don’t think they will ever go out of style and we always wanted a bright white kitchen. If you can work with a designer on this part, it definitely makes it easier and a little less stressful. There are so many measurements involved that even the slightest error can throw off your whole design. How do you pick a good designer? You ask around. Ask friends, family and neighbors or your contractor for their recommendations on a kitchen designer. That’s the best way to find a good one. We trust our contractor so we went with their local recommendation. We had the kitchen designer come to our house to take measurements first. We then met with them in their showroom and brought our lists and appliance information along. (from Steps 1 and 2 above). The designer gave us a lot of options and tips on where to save money which I’ll share next. We decided to go with custom plywood cabinets which are more durable than particle board cabinets. These cabinets can be painted any color we want (so we will have to decide on which white paint we want). A few days after we met with the kitchen designer, they sent us a preliminary drawing for us to approve. After a few minor changes, we were ready to roll! Now we are just waiting for the kitchen to be finished and the cabinets to be built and installed. And that’s pretty much the whole process in a nutshell. 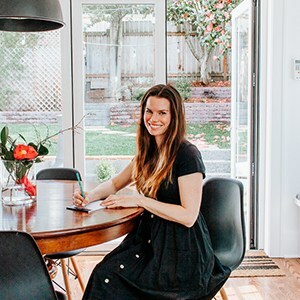 I basically picked the brain of our kitchen designer and he gave us some really good tips on saving money that I’m excited to share with you. There are options galore when designing your kitchen cabinets. All kinds of cool storage can be built to suit your needs. It will have you oohing and aahing and drooling all at the same time! But if you want to save money somewhere, this is one place to do it! 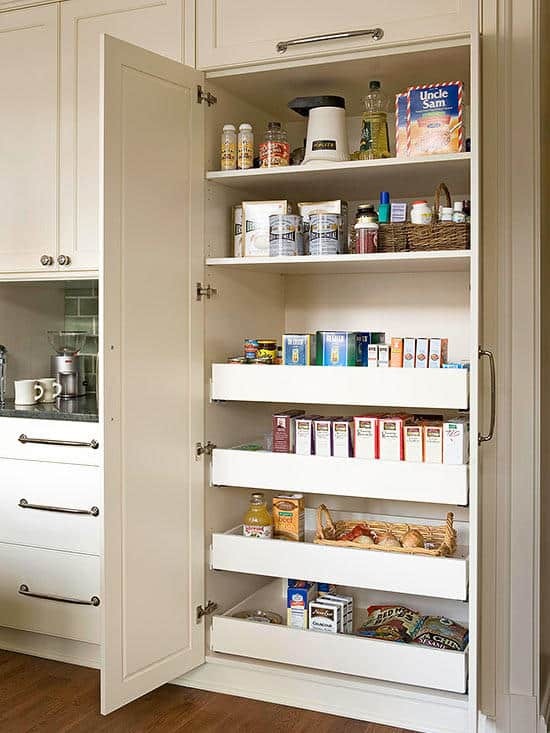 Our kitchen designer told us that a lot of these storage options can be purchased other places and put in by us for much cheaper than having the cabinet makers do it. I will have so much fun picking up some of these organization tools after the kitchen is finished. It’s one of my favorite things to do! The two custom options I wasn’t willing to give up were the pullouts in the pantry and the trash bin cabinets. That’s why it’s good to go over what your must haves are. Open shelving is super popular and can save you a good bit of money too. Instead of having to purchase more cabinets, you can buy a nice set of rustic wooden shelves to take their place. 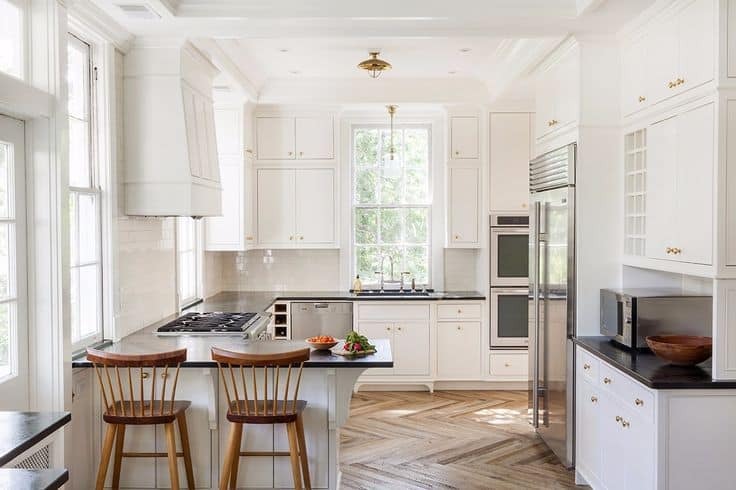 Our kitchen designer told us that any added embellishment – like corbels, a glaze, decorative legs – increase the overall price. So, if you want to keep the price within budget, opt for a simpler style. Actually – shaker style is one of the cheaper style options out there (provided you don’t use a crazy expensive wood). The drawer base costs more than a standard two door cabinet style. This might not be true everywhere but it’s good to know so you can at least ask or compare the costs when designing. One kind of sneaky way to save money is choose a flat front on the top drawer. So, for instance, if you decide to go with Shaker Style cabinets, the top drawer will be flat without the shaker design. See the photo above? You don’t really notice it but the drawer at the top is flat. I’m not exactly sure HOW much this saves but hey – saving money is saving money. I think the goal to having this process go smoothly and as quickly as possible is PREPARATION. Give me a P! Give me an R! What’s that spell? Ok, I’ll stop. Assess what you have, research your wants and needs and the style of kitchen you like, and work with a reputable designer. 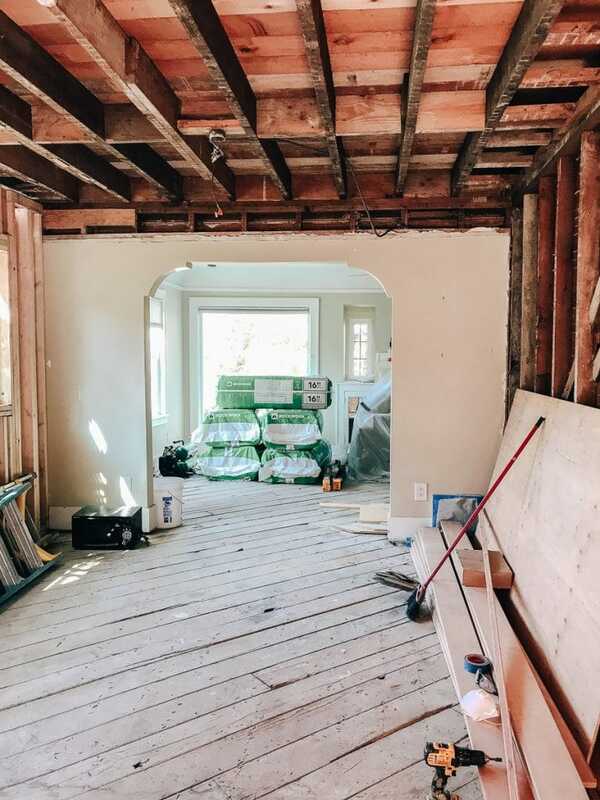 Subscribe to my weekly newsletter below to never a miss a renovation post and stay up to date.